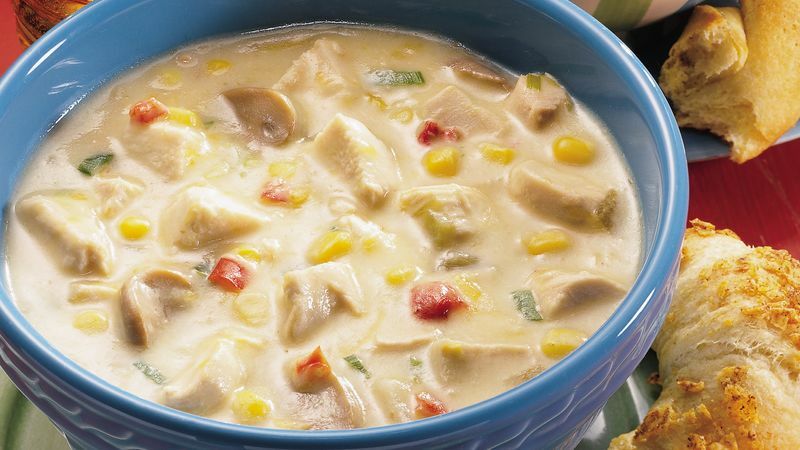 In 4-quart saucepan or Dutch oven, combine milk, broth, potato soup and chicken soup; blend well. Add all remaining chowder ingredients except cheese; mix well. Cook over medium heat for 5 to 8 minutes or until onions are tender, stirring occasionally. Remove from heat. Add cheese; stir until melted. While chowder is heating, bake crescents. Heat oven to 375°F. Shape dough as directed on can. Gently press top of each roll in crushed chips. Place on ungreased cookie sheet. Bake at 375°F. for 11 to 13 minutes or until golden brown. Serve chowder with crescents.